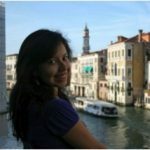 Vania Rolon | Welcome to the EvoS Consortium! Vania Rolón is a Master's student in the Psychology Department at SUNY New Paltz. Born and raised in Cochabamba, Bolivia, much of her fascination with Evolutionary Psychology is the field's ability to cross the cultural boundary and find universal behaviors. While completing her thesis, she works as a psychological statistics teaching assistant and is part of the Evolutionary Psychology Lab and the Positive Play Lab. Her blog discusses everyday life occurrences such as her experiences as an international student living abroad from an evolutionary perspective.